If your doctor has recommended an incision and drainage procedure to treat an abscess you may be wondering what the procedure is all about. How does it work, is it uncomfortable, and what happens after? An abscess is a painful infection that can drive many people to the emergency room. They result when oil-producing or sweat glands are obstructed, and bacteria is trapped. This causes an infection and inflammation along with pain and redness. Abscesses can form anywhere on the body. Commonly, they are found in the armpits, in the pubic region, at the base of the spine, around a tooth, or around a hair follicle, in which case the abscess is known as a boil. When an abscess forms, the pain, and inflammation can make you want to poke and prod it to try to clear it up on your own. However, doctors strongly caution against this as it often makes the infection worse and can cause lasting complications such as bloodstream infections (sepsis) and scarring. Instead, visit your friendly dermatologist for a simple and effective procedure known as incision and drainage, or I&D. An abscess will most often not heal on its own or even with antibiotics, and the pus usually needs to be drained to promote healing. An I&D, usually performed right in your doctor's office, can achieve this safely and comfortably. 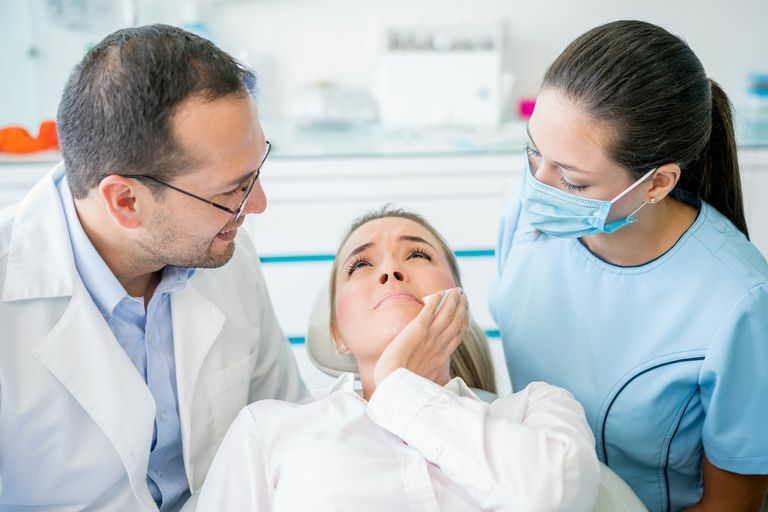 Using a local anesthetic (such as lidocaine) to numb the area around the abscess so you don't feel pain, a physician then inserts a scalpel or needle into the skin over the pus and the pus is drained. Some abscesses have more than one pocket of pus that must be ruptured to release all of the infected material. After the pus has drained, the wound will be cleaned and rinsed with saline solution. If it is not too large or deep, the wound may be packed with gauze bandaging for 24 to 48 hours to absorb any pus or discharge that continues to drain. If an abscess is particularly large or deep, a drain may be placed in the cleaned wound to keep it open and allow it to continue draining as it heals. After the I&D is completed and you are sent home, you should carefully follow your physician's directions about changing bandages and cleaning the wound. You may also be given antibiotics and told to take pain medicine as needed. If you notice any signs of infection, such as worsening pain, redness, swelling, bleeding, or fever, you should call your doctor immediately. Often times an abscess is a one-time thing which can be resolved with an I & D. For some people, a condition known as hidradenitis suppurative involves recurrent abscesses which form in areas such as the groin, the armpits, an under the breast. In addition to treating individual abscesses with an I & D, other treatments such as Accutane (isotretinoin) and steroid injections may be needed to control the disease. Before your I & D your doctor or nurse will likely ask you if you have MRSA. MRSA stands for methicillin-resistant staphylococcus infections. Many skin infections are caused by bacteria known as Staphylococcus aureus. Of these bacteria, some strains have undergone mutations which make them resistant to many of the antibiotics we have. Due to their ability to outwit many of our antibiotics, these bacteria are also often referred to as "superbugs." Infections with MRSA can range from very mild skin infections (such as small abscesses) to life-threatening infections. In the U.S. there are over 75,000 MRSA infections each year, though most occur in people who have been hospitalized. That said, at least 15 percent of these infections occur in the community and are referred to as community-acquired methicillin-resistant Staph aureus. If you carry MRSA it is important to share this with your doctor for two reasons: so those appropriate antibiotics are chosen if you need them, and so that measures can be taken to help reduce the spread of the bacteria. Habif, Thomas. "Bacterial Infections." Clinical Dermatology, 6th Edition. Ed. Thomas Habif, MD. New York: Mosby, 2015. Do You Need Treatment for an Epidermoid Cyst? Can Athletes Get Staph and MRSA Infections While Playing Sports?